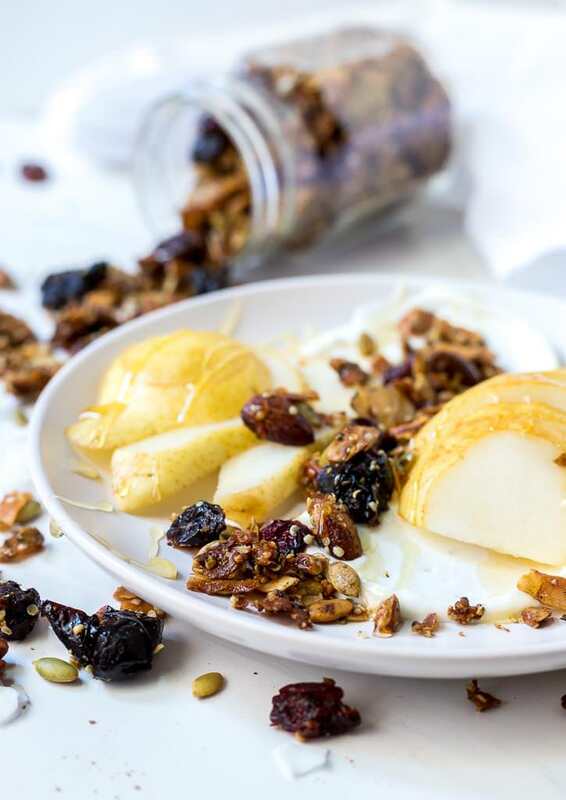 This Vegan Paleo Granola Recipe is great for snacks, breakfast or a dessert topping. Made with nuts, seeds, dried fruit and hemp seeds for an extra punch of nutrition. The maple syrup keeps this granola vegan friendly. Can You Have Granola on the Paleo Diet? The answer is yes, as long as it is grain free and made with natural sweetener. 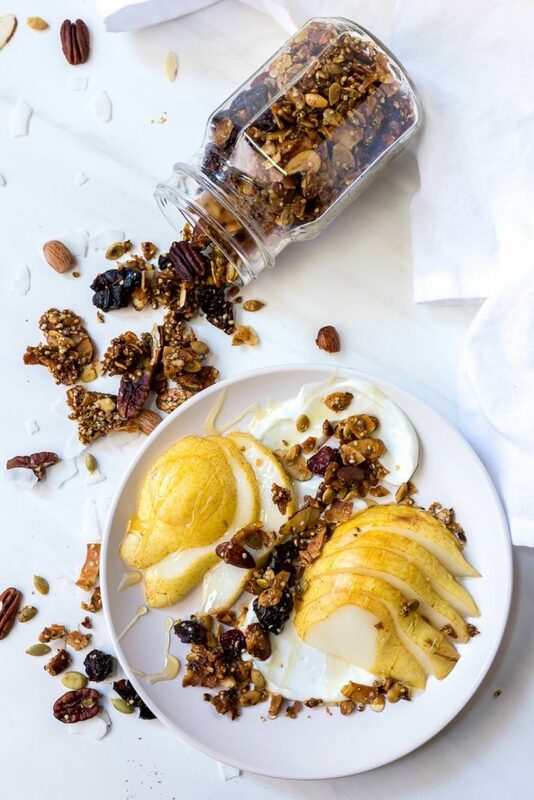 This Vegan Paleo Granola Recipe is made with nuts, seeds and maple syrup . . . making it Paleo compliant and vegan. There are store bought Paleo granolas that you could look into. But, I find homemade granola to taste so much better than the store bought varieties because of freshness. 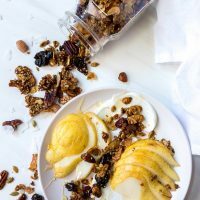 How Do You Make Paleo Granola? Easy. It’s like making regular granola just without the oats. Mix up your nuts and seeds. Then stir in the spices, oil and sweetener. Bake then stir in the dried fruit. That’s it! Can you use different nuts and seeds? Yes, if you love walnuts add some. Pistachios . . . go for it! Really you can swap in any nut or seed that you prefer or happen to have on hand. Do you have to use maple syrup? No, you can use honey. In fact, honey will make the granola stick together a bit better than maple syrup. However if you choose to use honey this granola will no longer be vegan. 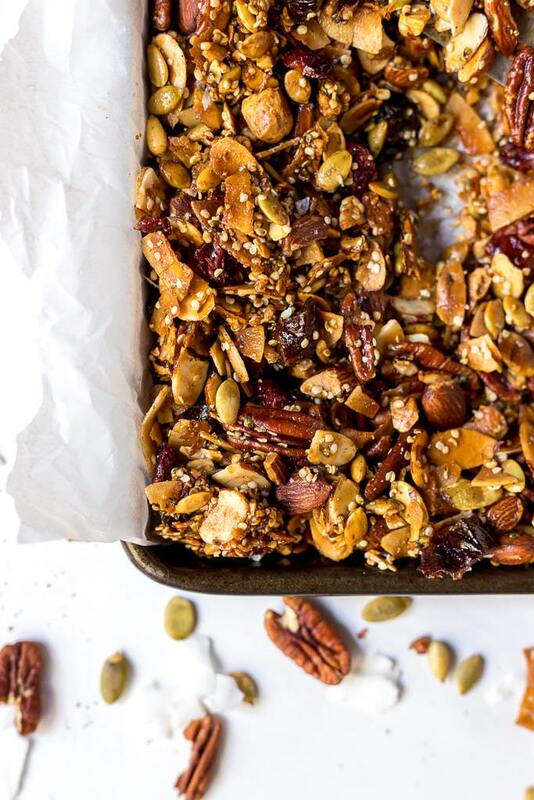 How do you store this paleo granola? Store it in an airtight jar, container or bag. Eat within a couple weeks before it begins to get stale. You will need a Sharp Knife, Good Cutting Board and a Rimmed Baking Sheet . You will also need parchment paper. 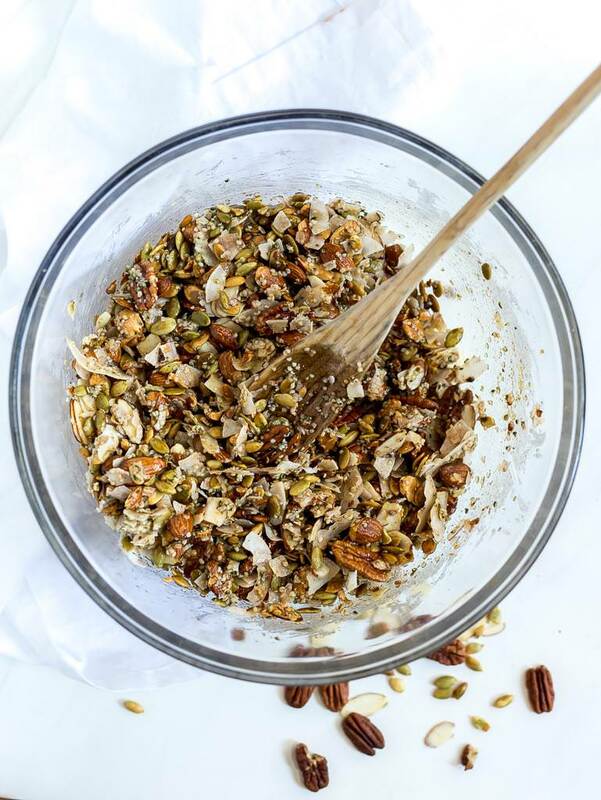 In a large bowl, combine almonds, pecans, pepitas, hemp seeds and coconut flakes. Combine maple syrup and coconut oil in glass measuring cup. Microwave 30-60 seconds or until coconut oil is melted. Stir in cinnamon, ginger, nutmeg and salt. Pour mixture over nuts and seeds. Stir until evenly coated. Transfer granola mixture to prepared baking sheet. Bake for 45-55 minutes or until granola is sticking together and no liquid remains. Stir frequently while granola is baking, every 10 minutes. Remove from oven and allow to cool for 10 minutes. Stir in dried fruit and add a sprinkle of flaked sea salt (optional). 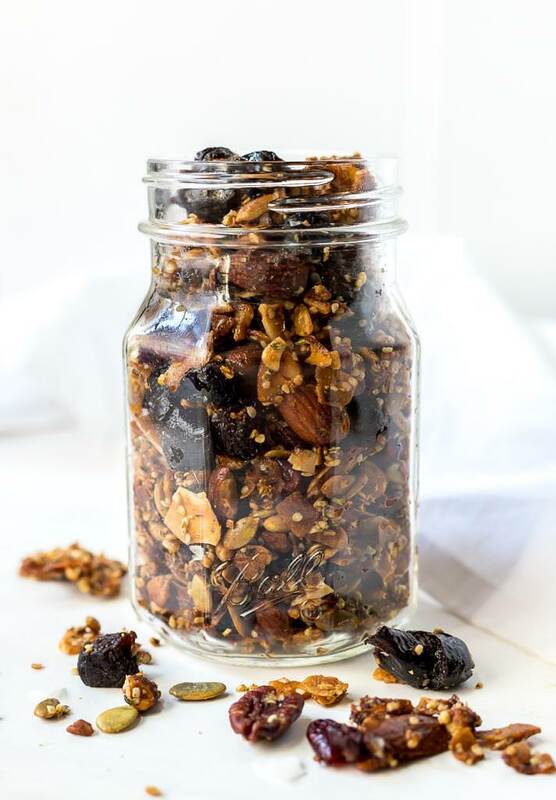 Allow granola to fully cool before transferring to an airtight container or jar.